In the next millennium, it is anticipated that human factors issues will take centre stage in initiatives targeted at enhancing economic competitiveness and productivity. This development is already discernible in nascent knowledge and digital based industries and economies, which are expected to emerge in force in the near future and continue to dominate thereafter. These developments will establish irreversibly the emerging global economy. The theme of the APCHI 2000 conference is: "Towards a seamless integration of collaborative human computer systems" to reflect the already discernible shift in focus of human computer interaction (HCI). whilst the theme of the ASEAN Ergonomics 2000 conference is: "From user centeredness to people centeredness" to reflect the imminent shift in focus that is required of human factors. 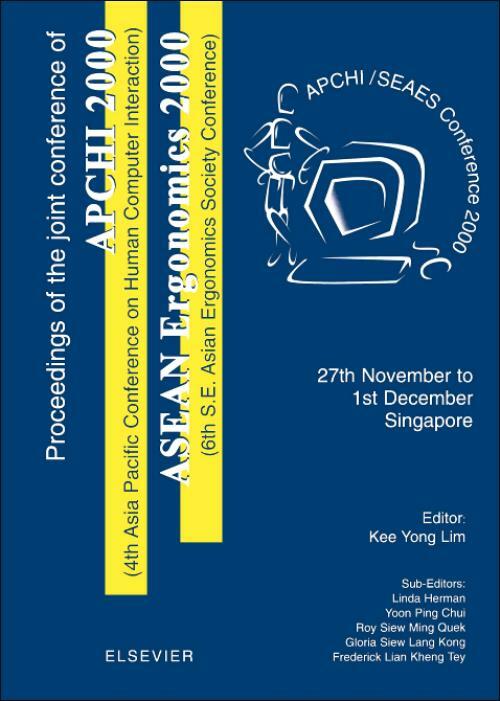 The papers in these proceedings provide a good contrast of human factors contributions to both old and new economies that make up ASEAN and APEC. They highlight the diverse roles human factors can play in advancing the quality of life in developed, developing and third world nations. They also serve as a guide to human factors practitioners in old economies on what to expect as their economies develop.